This amazing cake is originally from Italy. It's so good and so easy that Starbucks put it on their menu for awhile, but removed it when it didn't stay fresh long enough on the shelf. That's a shame, but we can just make it ourselves! It's wonderful as is, or frost with a simple orange glaze and fresh whipped cream. 1 cup coconut palm sugar or 1/2 cup honey. You could also try erythritol. Grease a 10 inch round cake pan. Dust with a little rice flour or cornstarch. Bake for 50 minutes, or until a small knife inserted into the center comes out clean. Allow the cake to cool in the pan. Tap out onto a serving plate when cool. 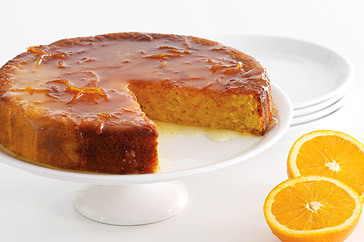 The glaze- To make the orange syrup, use a zester to remove the rind from one orange. Juice orange and set aside. Place rind in a saucepan of boiling water and cook for 5 minutes or until soft. Drain. Return to pan with orange juice and 3/4 cup honey or sugar free alternative of your choice. Place over low heat and cook, stirring, for 2-3 minutes or until the sugar dissolves and the syrup thickens. Best used the first day or keep in the fridge. Enjoy! !